← Meigle 1 Stone: A Pictish Camel? This class I stone, dating from around the 6th or 7th centuries, is located against the side of a Pictish round tower in the Perthshire village of Abernethy. The settlement at Abernethy is itself very old and has strong links to the Picts (sometimes described as the capital of the Southern Picts). It was an important Pictish centre, and is strongly associated with King Nechtan, although which one is open to debate (perhaps Nechtan son of Erip). The round tower dates from somewhere between 1000 and 1200 AD and represents one of the few round towers found outside Ireland (two in Scotland and one on the Isle of Man). A picture of the tower can be found at http://www.flickr.com/photos/53482954@N00/5394258599/. 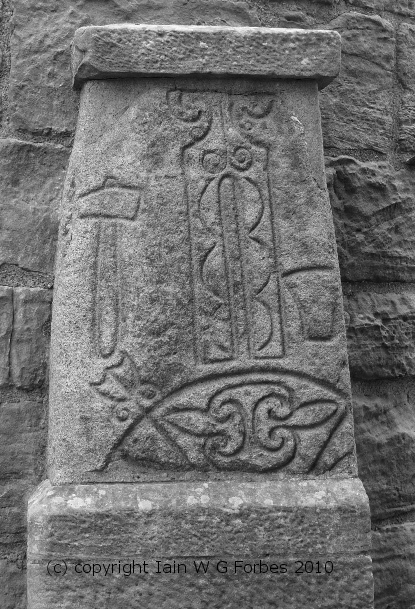 The Abernethy stone features is only partially intact, but the surviving incised symbols are particularly clear. The two principal symbols are a so-called ‘tuning fork’ and a ‘crescent and v-rod’. The ‘crescent and v-rod’ is an extremely common symbol, the ‘tuning fork’ less so. The ‘tuning fork’ is a particularly enigmatic symbol and there are no convincing theory as to what it may represent. There are two smaller symbols, in my opinion subsidiary symbols, which may lend further meaning to the main pair. The most common subsidiary symbols are the ‘mirror and comb’ but in this case they comprise what are thought to be a hammer and anvil. These symbols, associated with the blacksmith, have a strong folklore amongst the Celts. Firstly they are the tools of the god Goibniu, but also perhaps symbolise the union between male and female, forging the bonds between the ‘female’ anvil and the ‘male’ hammer. Marriages ceremonies are carried out at Gretna Green in Dumfrieshire over an anvil, but it is not entirely clear what the origin of these are. Posted on December 1, 2011, in Pictish History. Bookmark the permalink. 4 Comments. Thanks very much, glad you enjoyed it! Hi ian, not sure if you are really in this category, but what the h*ll…I have nominated you for the Versatile Blogger Award – Check out my post http://annfoweraker.com/2012/oh-my-oh-my-versatile-blogger-award/ to see the award and read some instructions that go along with it.